Welcome to a pixelated world! These Minecraft gifts will immerse you into a fun building game. Any Minecraft fan is sure to love these gifts and welcome them into his collection. Minecraft is a never-ending game based on blocks. As the game progresses, you can collect material that will help you get ahead and build new objects, or improve the ones you’ve built. 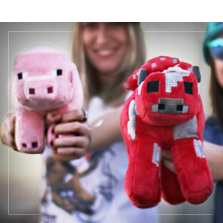 Browse all of the Minecraft merchandise available at Funidelia and find mugs, keychains, wallets, backpacks featuring the main tools of the game, Funko Pops, caps and original Minecraft stuffed toys for all of the game’s characters you love. If you know a gamer who sees life through cubic blocks, find the perfect gift that is sure to impress. These Minecraft gifts are perfect for impressing fans. Let’s take a closer look at all of the Minecraft gifts you can get for a fan of the game, or for yourself, as a super special treat. 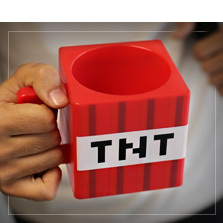 Minecraft merchandise includes some very cool mugs that feature the game’s characters, and check out this square one that comes with a pixel shape. 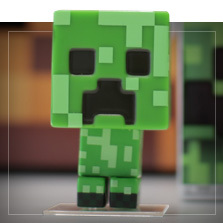 Also, discover our fun pixelated Minecraft Funko Pop figures and stuffed toys. Backpacks are always a practical gift, and be sure to browse our keyrings, caps, wallets, bracelets and necklaces. 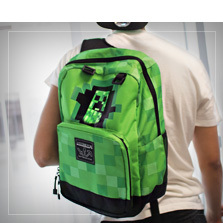 All of these Minecraft gifts and accessories have a pixelated design, so symbolic of the game. You’ll love them all!